While as a general rule, Squaw Butte doesn’t schedule chapter pack trip as part of their yearly schedule, members do get together and plan “private” trip into the various national forest and wilderness area throughout Idaho and nearby states. The 2011 summer was no exception. A number of trips were planned and taken. Some of the members shared their adventures with the group while other kept their experiences as private memories. Two trips that were shared were a six day saunter into the south eastern portion of the Sawtooth Wilderness. This trip started at the Grandjean trail head and followed the South Fork of the Payette river to it’s headwaters. 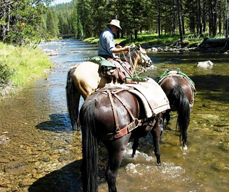 The group camped at two excellent horse camps located by Elk and Ardeth lakes. A slide show video of this trip was posted on the chapter page on Youtube. A number of the female members of the chapter banded together in September for a long weekend trip into the Frank Church Wilderness. Their experience, ranged from first timers to old hands. They choose the Elk Meadows area just north of Bear Valley. This area is known for its lush meadows, easy access to camp sites and a very pretty mountain lake. Their adventures are shared in “Equines & Estrogen” and “Girls Gone Wilderness” and in a Youtube video slide show. Next labor day the chapter is hosting a long weekend mini-pack trip in to the Big Basin area south east of Sun Valley. More information about this upcoming trip will be posted in this blog in the future.